Save your ears from ill-fitting Apple earbuds. Snap them into this earbud hook. It loops around the outside of your ear—so no more jamming buds in to stay put. 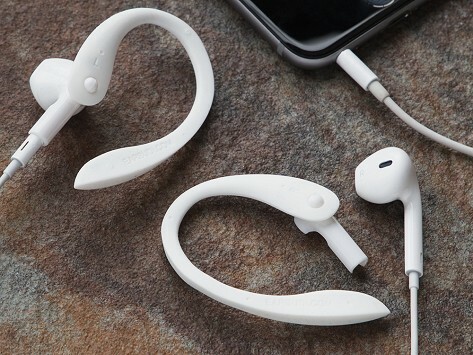 Mold the flexible loop to give your earbuds a custom, comfortable fit. 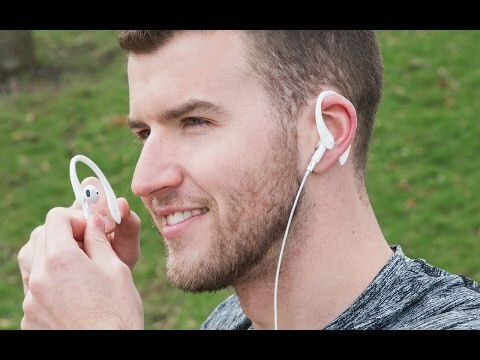 They’ll stay in your ears, too, whether you’re exercising or hanging out. Dimensions: 2.5" x 1.5" x .35"
Earbuds did not stay in my small ears. This innovation solved that problem. I have 3 pairs of these. Earbuds fall out. With these, they stay put. Tried a lot of others, unsuccessfully. These work. Finally I could use my earbuds to watch a movie comfortably on an airplane. They worked beautifully!!! I’m going to order another pair! EARBUDi is an earbud hook that makes those one-size-fits-all Apple earbuds work for every ear. Snap them inside these over-the-ear loops. The flexible design lets you shape them to fit perfectly—and comfortably. Whether you’re at work or working out, your earbuds will stay put. Gordon Beckhart created EARBUDi for hitting the slopes, running, or even just walking around. After trying several different styles without success, he went back to the standard issue Apple earbuds. He invented this so they would fit well enough to experience their high sound quality. If you like to hear the noise around you, you can even wear your hooks a little looser. Whatever your preferred fit, Apple’s earbuds now conform to you.